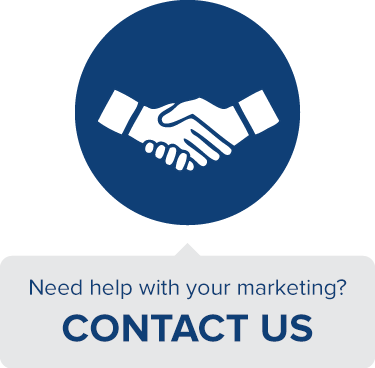 Social media marketing is a tough discipline to master because it makes two demands of marketers that seem to contradict each other. On the one hand, the data-driven nature of social lends itself to a bottom line-oriented mode of thinking. In addition, consistency is likely the most important factor when it comes to succeeding as a social marketer. However, the difference between a forgettable social effort and a truly impactful presence is to be the opposite of consistent. Great social brands are whimsical, full of surprises and act more like the people they interact with than the gigantic corporations they represent. How can organizations balance these two seemingly opposing needs? Is there a way to systematically foster spontaneity or is that a contradiction in terms? Read on to explore actionable strategies for balancing these two seemingly opposite (yet integral) components of successful social media marketing. As anyone who has ever been to a surprise birthday party or watched a scary movie knows, the unexpected has a uniquely strong ability to elicit a powerful emotional response. A study done by Emory University showed that unexpected stimuli actually led to a strong and self-reinforcing positive interaction in subjects. Another study carried out at Brown University demonstrated that unforeseen events are more likely to change our feelings, beliefs and associations. In sum, what a large body of scientific findings prove is that spontaneity has a great deal of potential when it comes to doing two things that are central to marketing: capturing people’s attention and turning that attention into a positive response. As I’ve written in a previous article, brands on social are performing a delicate balancing act in which they attempt to interact with customers on a human level while still acknowledging that they are really not people. 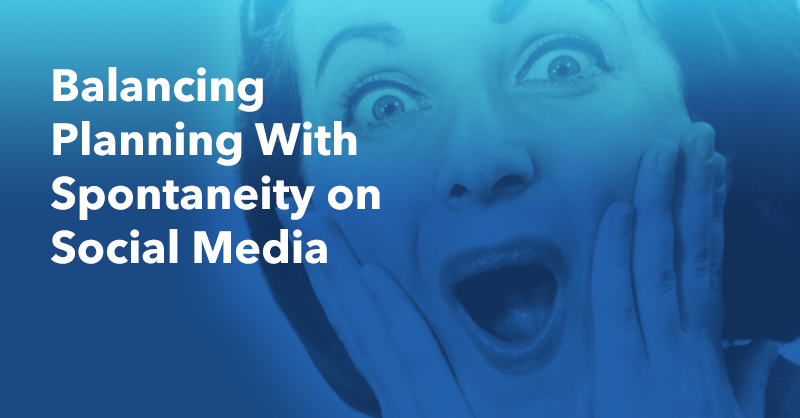 One excellent tactic to help brands be more relatable on social is to embrace spontaneity. Most people don’t plan their tweets weeks or months ahead, and doing so reeks of self-promotion. Brands that react spontaneously to their customers or to events (that their customers care about) will have a much more natural and relatable social presence. Another important trend to pay attention to is that Millennials (the demographic most likely to make purchasing decisions based on social) are also notorious novelty seekers. 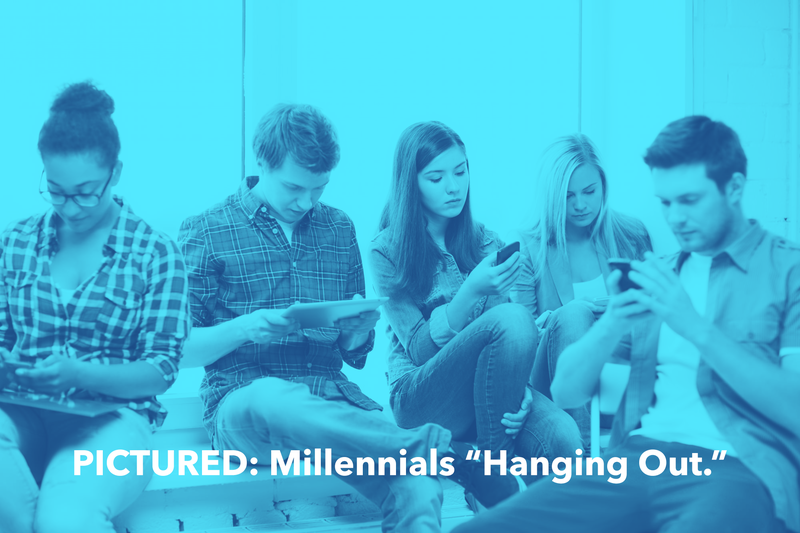 Millennials are often referred to as the first “Unbored Generation.” In a recent Pew poll found that nearly all 18-29-year-olds will turn to their phone to avoid boredom. All this is to say that what your brand has to say on social better be more novel than whatever else is going on in the millennial’s immediate surroundings. The most receptive social audience is also the most fickle, and if you are boring you will never make an impact. Too much predictability is social media suicide. Spontaneity is clearly important for social media from an audience point-of-view, but how can brands hope to build a consistent and reliably successful marketing campaign that still remains fresh and novel? It’s certainly possible. In fact there are a select few brands that make spontaneous social look easy. However, just looking at the results doesn’t paint an accurate picture of the process behind them. 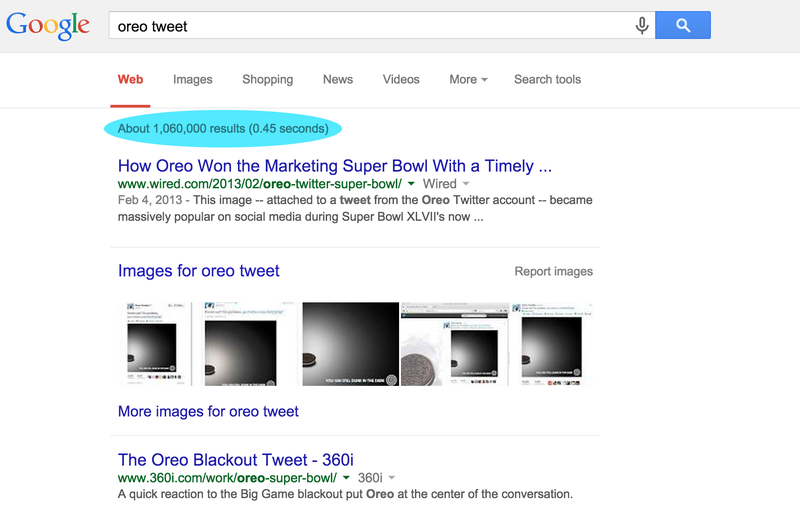 Perhaps, no digital ink has been spilled more on a topic than on the now legendary “Oreo Superbowl Tweet.” To summarize a point that was subsequently beaten to death, Oreo spoke a language its fans wanted to hear, redefined what companies could do with social, and stole a show regularly dominated by million dollar commercial spots for pennies and cleverness. So much was celebrated about the results of Oreo’s social stroke of genius that many missed the real lesson to be learned. That tweet did not just come out of nowhere. 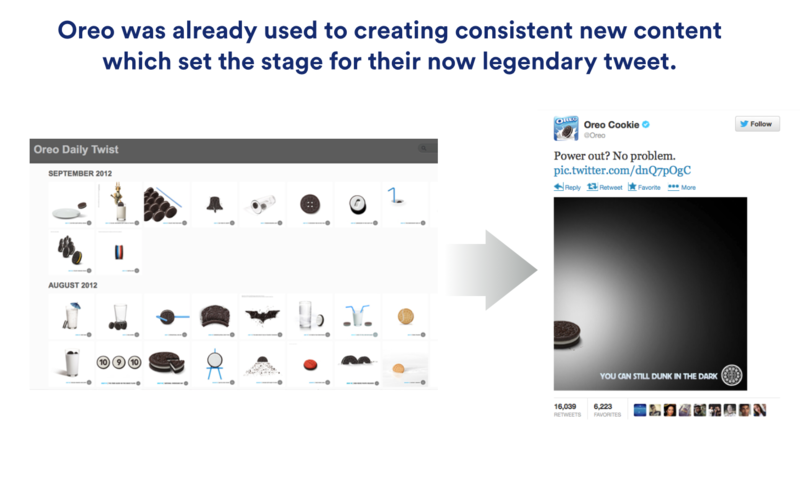 The previous year saw Oreo become a fine-tuned, well-planned social engine. They pumped out a new relevant, unique and timely piece of visual content every day for the better part of a year. The tweets were planned, but they created a culture and habit where content could be concepted created and approved quickly. This type of snap collaboration was not new for Oreo, however, as the brand had laid a foundation for real-time, culturally relevant content creation through the Daily Twist program and similar efforts during the previous several months. The lesson here is that spontaneity can be fostered on the organizational level, and the type of content that appears effortless and natural is actually the result of a fairly disciplined marketing culture. Although the 80/20 rule has many iterations in digital marketing strategy, the principle can be appropriately applied to a healthy balance of planned vs. spontaneous content. As I’ve repeatedly said on this blog, consistency is the key to content marketing success. Unfortunately, spontaneity and consistency don’t really go together all that well, so the backbone of any strong content effort will likely be of the planned variety. When budgeting your time, resources and creative capacity, allot approximately 80% for the creation of consistent planned content. However, just because the Lion’s share of your content will be planned, that doesn’t mean that it can’t be creative, timely and engaging. In fact, it will only be through the sustained effort of creating this kind of consistent habit that you and your team will hone your ability to be spontaneous during the other 20% of the time. 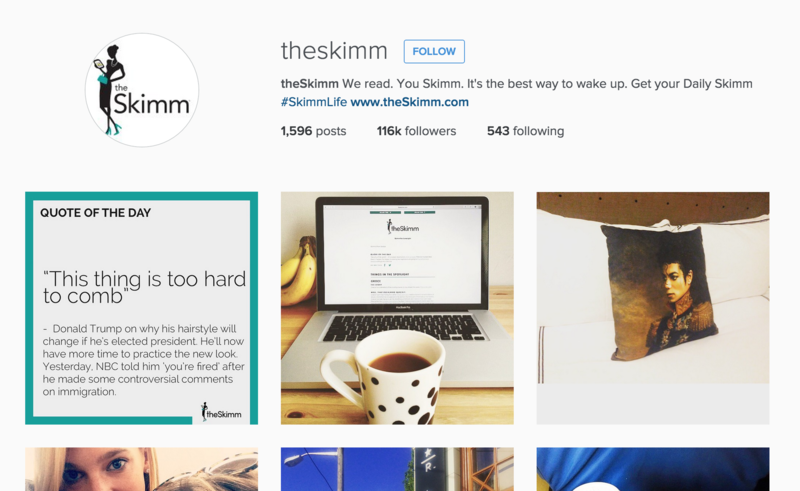 A great example of this type of consistent, yet strong social content-creation is the Instagram feed of the wildly popular daily email newsletter, theSkimm. 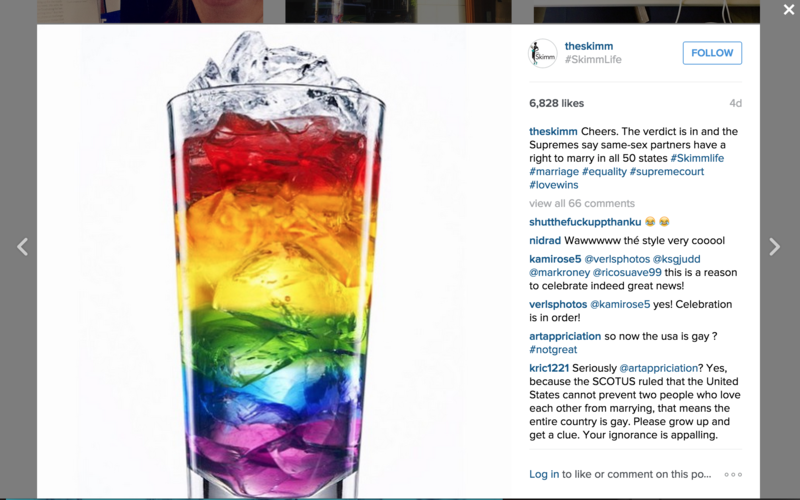 One recent instance of this interplay between planning and spontaneity is how theSkimm covered the recent Supreme Court ruling on gay marriage. Since they are a daily newsletter focused on current events, they have been steadily and consistently been releasing content surrounding the decision, but by far the most successful post in their recent history was a seemingly spur of the moment celebratory post once the ruling came down. Even if this post was not entirely spontaneous, the quick response presence they have built gave the post a convincing enough feeling of genuine reaction. A common theme that runs through traditional 80/20 rules and the new one I am proposing is that typically the 20% side will end up producing 80% of the results. This means that if you gauge the overall social traction of all of your posts, 80% of your retweets, likes, shares, etc… will come from just 20% of your posts. And many of that 20% will be from the spontaneous posts that are born from the experience you gain from regular, consistent posting. Both elements are necessary to social success, and you cannot possibly have one without the other. The first component to building a spontaneous social team is to trust your employees to act autonomously. If there is too much bureaucracy or approval standing in the way of a great social post and its actual posting then you’ll never be able to react spontaneously. Because approval is sometimes necessary to some degree, another important part of a spontaneous social team is a collaborative spirit and open channels of communication. Truly great social teams will have a non-hierarchical structure. For example, although the social director might be planning the tweets, she does not have ultimate veto power over the creative department or copywriters or even the intern. One last crucial component of a social team is the “always-on” mentality. This is much easier said than done and requires you to ask a lot of your employees, but there are certainly ways to give-and-take and have your social team “on duty” during at least big social events. Fostering a strong team dynamic where each individual feels that they have ownership over the entire effort, and building instincts and habit through consistent planned social media posting are both great ways to create a dynamic and spontaneous social team. Building and managing a spontaneous social team is certainly not an easy feat; however, there are certain tools and techniques that can make the job much easier. The first, and probably most essential tool is a robust, and actively collaborative editorial calendar. Having a clearly outlined and accessible content calendar that anyone can contribute to will be key in getting your social team to act autonomously but still enforce accountability and oversight. Another way to foster a culture of responsive social media is to host regular “viewing parties” of relevant events in your industry. Provide a fun, collaborative environment with food, drinks, socializing and make it a fun experience. Even pay overtime if need be. Not only will events like this loosen up your team and make them more spontaneous, and creative; hosting them regularly will also build a team spirit that can extend into normal work hours and lead to improved performance and spontaneity across the board. While none of these strategies can guarantee spontaneity, they will certainly create the ideal conditions for such a culture to take root. Make a concerted effort and you will likely see improvement – the results might just surprise you.